Few events in history have provoked more contemporary interest, emotion, and passion than the American Civil War. The Civil War and its momentous battles have been studied and debated, analyzed and dissected. What was once a brutal, cruel, and violent battle is sometimes viewed through the filter of time as romantic, gracious, and gallant. Southerners are portrayed in film as dashing cavalry officers dressed in radiant uniforms. Confederate combatants are portrayed in fiction and portraiture attending lavish balls and cotillions, defending their cause advocating for state’s rights. Union heroes are ironclad seamen fighting with new technology that revolutionized warfare at sea. For years, historians with a knack for acting have portrayed protagonists of the past in this War Between the States. Some favor the South, some the North, while others take on civilian personalities or humble soldiers. Some assume roles of grandiose leaders like Abraham Lincoln and Jefferson Davis. Some are doctors, some embalmers, and some photographers offering tintypes of reenactors in their regalia. Women in period gowns accompany their escorts dressed as generals and admirals to Victorian-era dances. Imagine members of CWHI encamped in period tents in a copse of trees at Gettysburg’s Artillery Ridge Campgrounds. Just across the street from Artillery Ridge, the National Park Service preserves the battlefield that saw 51,000 casualties over three days of fighting on July 1-3, 1863. Sonntag became interested in the Civil War as a young boy. 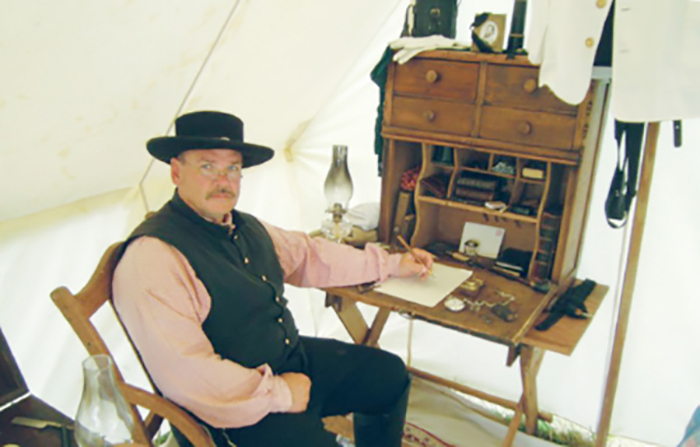 He began reenacting as a hobby, first as an infantryman then learned the ways of an officer. For the last eight years, he’s been a living historian portraying Dr. McGuire. CWHI’s Vice President Carol Polkinghorne joins him. Dressed in a magnificent hooped gown, Polkinghorne leads discussions under a period tent. Spectators from Artillery Ridge Campground and the general public sit on hay bales as Polkinghorne portrays a southern woman working with the Dixie Rose Relief Society. She’s proud that young girls less interested in the marching and “left flank, right flank” of warfare can see a picture of what it would have been like for them during the Civil War. After the war, Dr. McGuire founded St. Luke’s Hospital in Richmond, a medical school, and two nursing schools. He later became president of the American Medical Association and the American Surgical Association. “He was the first doctor to perform a successful abdominal aortic aneurism operation and the first successful hysterectomy,” Sonntag says. “He came from a family of surgeons. In addition to reenactments, Sonntag and CWHI also preserve historical landmarks, and they’ve restored and replaced cemetery tombstones. The organization expects to be granted 501(c) 3 nonprofit status soon, helping to further their cause of teaching America’s history through first-person impressions, living history demonstrations, and battlefield reenactments. “The last thing my mother told me before she died was, ‘Harry it is not about you. It’s about helping others.’ Here I am,” Harry says, feeling the emotion imbued by his mother’s advice.